While we watch as avian influenza viruses make tentative jumps to humans - and are justifiably concerned over their pandemic potential - many researchers believe that pigs may pose an even bigger risk of producing the next pandemic virus. Last December, in PNAS: The Pandemic Potential Of Eurasian Avian-like H1N1 (EAH1N1) Swine Influenza, we looked at a study where researchers had isolated and characterized a number avian H1N1 virus variants circulating in Chinese pigs that had the ability to infect, and potentially transmit efficiently, in humans. 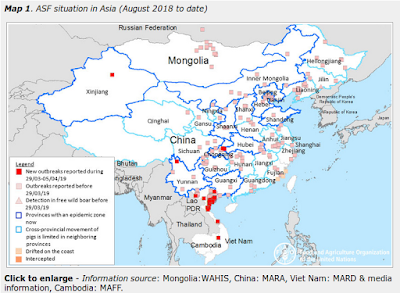 And in June, in Sci Rpts: Transmission & Pathogenicity Of Novel Swine Flu Reassortant Viruses we looked at another study - again out of China - where researchers experimentally infected pigs with one of these Eurasian-Avian H1N1 swine influenza viruses and the 2009 H1N1pdm virus. All of which brings us to an EID Journal report today, on the 30-month old child from Hunan Province, who was infected with one of these reassortant EAH1N1 viruses. Not only do we learn about the course, and severity, of the child's illness, we also learn that in a mouse model, this reassortant virus displayed increased infectivity and virulence. In 2015, a novel influenza A(H1N1) virus was isolated from a boy in China who had severe pneumonia. The virus was a genetic reassortant of Eurasian avian-like influenza A(H1N1) (EA-H1N1) virus. The hemagglutinin, neuraminidase, and matrix genes of the reassortant virus were highly similar to genes in EA-H1N1 swine influenza viruses, the polybasic 1 and 2, polymerase acidic, and nucleoprotein genes originated from influenza A(H1N1)pdm09 virus, and the nonstructural protein gene derived from classical swine influenza A(H1N1) (CS H1N1) virus. In a mouse model, the reassortant virus, termed influenza A/Hunan/42443/2015(H1N1) virus, showed higher infectivity and virulence than another human EA-H1N1 isolate, influenza A/Jiangsu/1/2011(H1N1) virus. In the respiratory tract of mice, virus replication by influenza A/Hunan/42443/2015(H1N1) virus was substantially higher than that by influenza A/Jiangsu/1/2011(H1N1) virus. Human-to-human transmission of influenza A/Hunan/42443/2015(H1N1) virus has not been detected; however, given the circulation of novel EA-H1N1 viruses in pigs, enhanced surveillance should be instituted among swine and humans. EA-H1N1 SIVs have been shown to preferentially bind to human-type receptors, and ferrets have been experimentally infected with some EA-H1N1 SIVs via respiratory droplet transmission (12). EA-H1N1 SIVs reportedly have the potential to transmit efficiently and cause a pandemic among humans after long-term evolution in pigs (12). We report a severe human infection with a reassortant influenza virus in China and the results of genetic, infectivity, and virulence investigations of the novel virus. In conclusion, EA-H1N1 swine influenza viruses occasionally infect humans. We report on a novel EA-H1N1 virus reassortant, HuN EA-H1N1 virus, which was isolated from a boy in China with severe pneumonia. The virus contained 2 surface genes from an EA-H1N1 virus and 4 internal genes from A(H1N1)pdm09 virus. Dr. Zhu is an influenza researcher at the Chinese National Influenza Center, National Institute for Viral Disease Control and Prevention, Chinese Center for Disease Control and Prevention. Her research interests include evolutionary analysis and pathogenicity mechanism of influenza viruses. Since the influenza subtypes that commonly circulate in swine (H1, H2 & H3) are also the same that have caused all of the human pandemics going back 130 years (see Are Influenza Pandemic Viruses Members Of An Exclusive Club? ), they are generally regarded as having less far to `jump’ to humans than many avian viruses. Which is precisely how the H1N1 pandemic virus emerged in 2009, after kicking around (and reassorting in) swine herds for a decade or longer.